The toe nail is susceptible to trauma in so many ways. The most common injury to the nail is a bruise beneath the nail called a subungual hematoma. The bruise (hematoma) forms beneath the nail (subungual) when the nail is compressed or avulsed (pulled away) from the underlying nail bed. More severe injuries to the nail include lacerations to the nail bed and crush injuries to the soft tissue and bone. The nail grows from a small pocket of cells called the nail matrix. As each new generation of cells is formed, they push the previous generation of cells out along the nail bed toward the end of the finger or toe. As a result, the nail grows by being pushed out and off the nail bed. There are several structures that make up the nail. The lunula is a white, crescent-shaped structure at the base of the nail. The lunula may be large or small, and in many cases even absent altogether. The function of the lunula is unknown, but some have speculated that it represents the distal extension of the nail matrix. 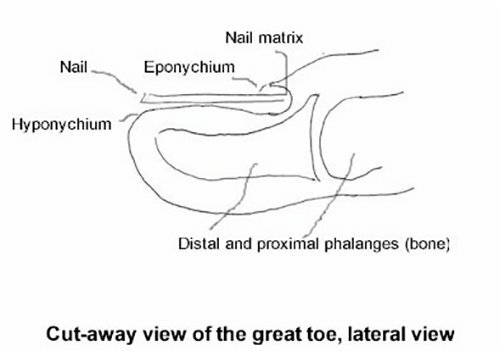 The hyponychium (cuticle) is found at the base of the nail and creates a transition zone from the skin to the nail, allowing the nail to slowly move away from the matrix to the distal tip of the nail. 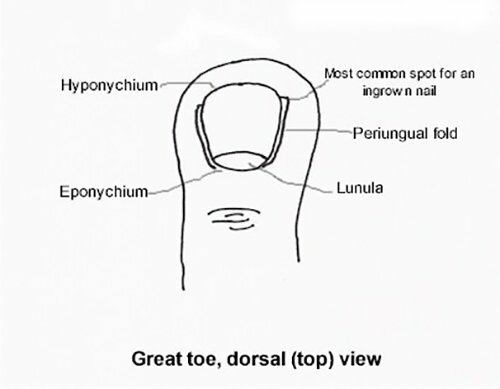 At that point, the attachment to the nail is referred to as the eponychium. 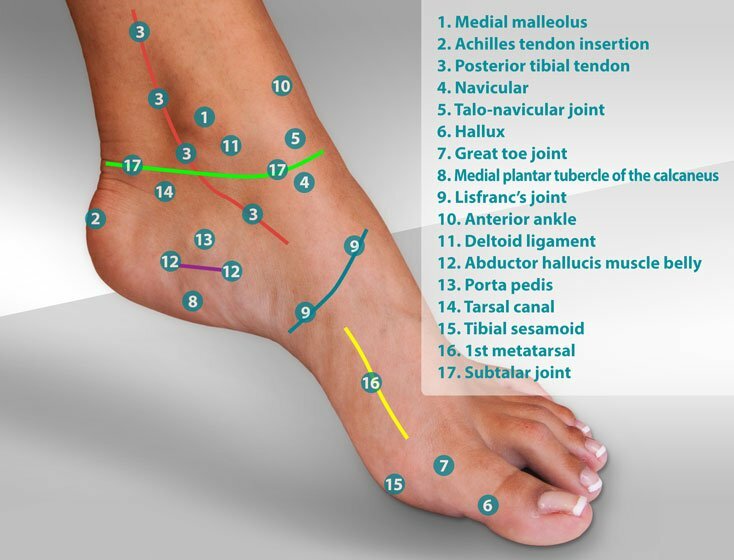 Nail injuries can occur at one or several of the points where the nail attaches to the nail bed. The two most common injuries are partial avulsions of the nail and compression or crush injuries. Bruising beneath the nail when associated with sports is called runner's nail. Contributing factors to toenail injuries include performing tasks while barefoot or wearing inadequate shoes for a particular task. Prevention of toe nail injuries includes the use of the proper shoes for each part of your life. Steel toed shoes are commonly used to prevent nail injuries in an industrial setting. Choosing a wide toe box may help for dress shoes and running shoes. Use of a tongue pad is helpful in limiting the forward excursion of the foot in the shoe that contributes to nail injuries. A tongue pad is a useful tool for runners to prevent runner's nail. When you do sustain a nail injury, follow these directions. Be sure to wrap the injured toe with a clean (preferably sterile) bandage for 30-60 minutes following the injury. During this period of time, elevate the foot. This rest period will enable bleeding to subside. Once bleeding has stopped, evaluate the status of the nail plate. In most cases, try to keep the nail plate in place. If the nail is intact but bruising has formed beneath the nail, the fluid beneath the nail needs to be drained. Draining this fluid will relieve the swelling beneath the nail and significantly reduce pain. If the nail is attached and a subungual hematoma is present, drain the subungual hematoma using a fine drill. In cases of subungual hematoma or partial nail avulsion, soak the injured nail twice a day in soaking salts or Epsom Salts following the directions on the box. If the nail is partially avulsed, secure the nail in place with butterfly sutures. Monitor the injured nail for redness, swelling, or signs of infection. If you suspect an infection, call your doctor for an antibiotic and possible removal of a portion of the damaged nail. Long-term management of the nail requires a little patience and a lot of compliance. 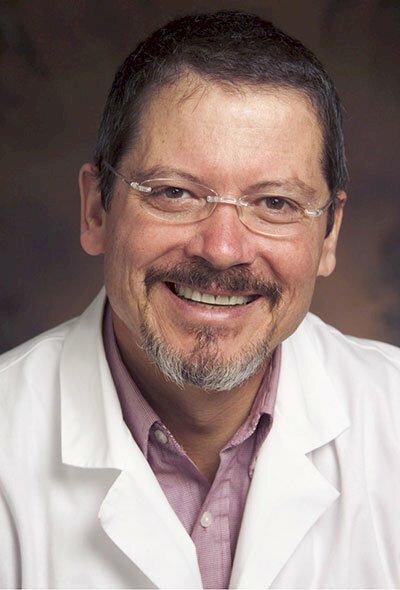 The most important long-term consideration isn't the prevention of soft tissue bacterial infection. What's most important is treating the nail to prevent a fungal infection. 7-10 days post-injury, the tissue surrounding the nail becomes much less susceptible to bacterial infections. Continued use of antibiotics will, in many cases, actually contribute to infection. The image at left shows a superinfection of the skin adjacent to the nail resulting from the over-use of a topical antibiotic. And what's so striking in this image is the fact that the remaining portion of the nail is significantly infiltrated with a fungal infection. The lesson here is that once the potential for bacterial infection is resolved, shift gears and begin treating the nail for a fungal infection. Remember, all fungal infections of the nail begin with an injury to the nail. Therefore, all nail injuries should be treated with a topical antifungal medication to prevent the onset of a fungal infection. Prior to an injury, the nail acts as a barrier and is able to fend off fungal infections. Following an injury to the nail, the door of susceptibility swings open, allowing the fungus to infiltrate the nail. It's important to apply an antifungal medication to the nail for the entire length of time it takes the new nail to grow out. This length of time can vary but is typically 3-4 months for fingernails and up to 10 months for toenails. Proper application of an antifungal medication requires compliance. Fungus doesn't take a day off and neither should you. 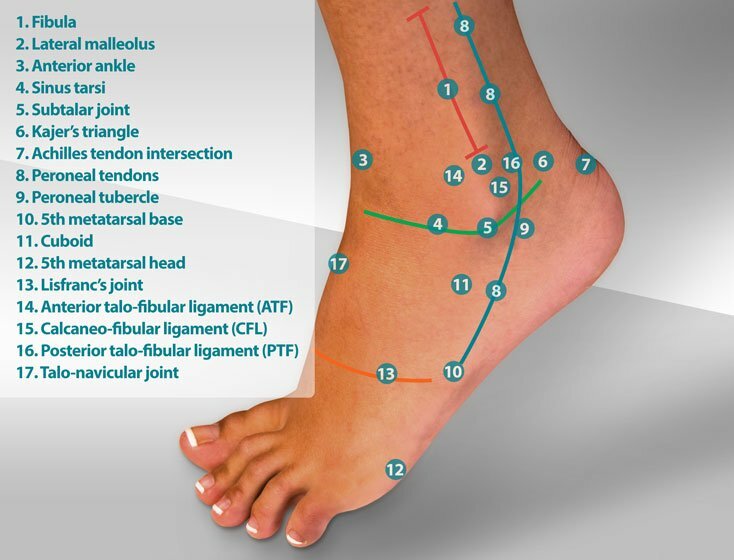 All it takes is a very small amount of topical antifungal applied twice a day. For more information regarding nail fungus, please review our article on onychomycosis. 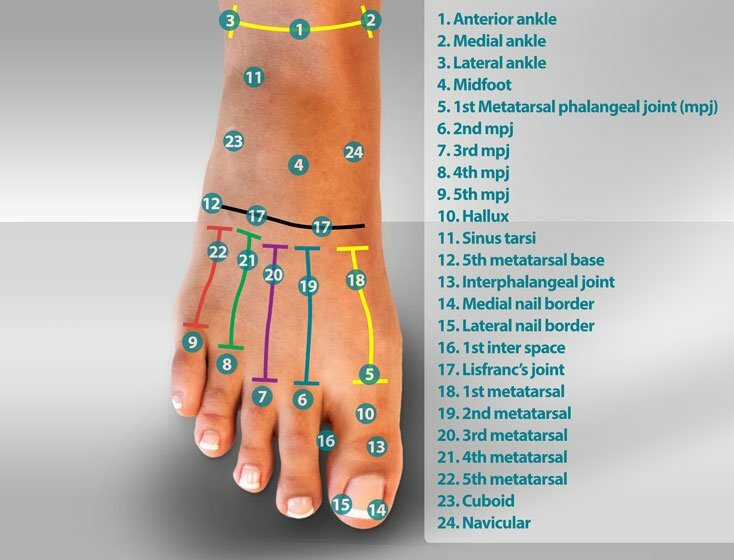 Treatment Guide - patient guidelines for treatment of nail fungus. Many nail injuries can be managed at home. If signs of infection (redness, swelling or increased drainage) do occur, consult your podiatrist or primary care doctor for additional treatment recommendations. Most recent article update: April 10, 2019. Toe Nail Injuries by Myfootshop.com is licensed under a Creative Commons Attribution-NonCommercial 3.0 Unported License. The CurveCorrect Ingrown Toenail Treatment Kit is the safe, non-surgical way to relieve pain and treat ingrown toenails at home. Each kit includes everything you need to fix ingrown toenails. By CurveCorrect. 1 kit has 10 applications/pkg.